In May last year, Wal-Mart Stores Inc. started testing a programme under which the Bentonville, Arkansas-based retail giant planned to use store employees to deliver online orders. Under the initiative, called Associate Delivery, Wal-Mart’s employees are assigned packages based on where they live and, at the end of their work-shift, the employees deliver products to customers on their commute back home. The planning, logistics and monitoring of the project is done from the firm’s technology facility in Bengaluru, Wal-Mart Labs. Set up in 2012, Wal-Mart Labs helps the retailer use newer technologies such as data analytics and artificial intelligence-led platforms to help it run its business better, as the retail giant battles competition from e-commerce giant Amazon.com Inc. Understandably, company executives consider its Bengaluru unit vital to the firm. “It (Wal-Mart Labs) is the most important thing. It is the DNA," said Srinivas Venkatesan, vice-president, product and engineering (supply chain) at Wal-Mart Labs. Venkatesan conceded that had it not been for Wal-Mart Labs, the retailer would have outsourced the work to an information technology (IT) firm like Tata Consultancy Services Ltd or Infosys Ltd. After all, Wal-Mart spends a lot on technology outsourcing: the retail giant does not disclose its annual spending on outsourcing, but, according to executives in the know, Wal-Mart spends over $5 billion every year on outsourcing tech-related work to multiple companies. Insourcing, or more companies looking to cut their dependence on third-party IT firms and moving work to their captive centres, has emerged as a cause of worry for India’s $154-billion IT outsourcing industry, which is already grappling with the twin challenges of adapting to newer, digital technologies and dealing with the fallout from US President Donald Trump’s protectionist policies. “When you get product-centric (writing codes, which help a company launch platforms that allow it to run business better), we look to be within our company because we will not want to be outsourcing," said Venkatesan. Over the past decade, faster computing power and higher Internet usage has made companies such as Wal-Mart and some other Fortune 1000 firms look at newer technologies such as data analytics to run their business better. This has prompted more firms to set up own technology facilities or captive centres in India (and other relatively inexpensive locations) rather than merely farm out work to outsourcing firms. This is primarily because the cost of setting up their own captive or technology facilities is still less than what it would cost to outsource the work. Also, companies consider this element of technology work to be too important to be outsourced. They believe the work can be done more productively from their own captive offices. Over the past five years, some of the largest clients of Indian IT firms, including General Electric Co., UBS AG, General Motors Co., AstraZeneca Plc., Visa Inc. and JC Penney Co. Inc,. have all set up their own global in-house centres (GICs) or captives. “In some cases, the expressed intentions in terms of insourcing are as high as 60-90% of overall IT spending (versus just the opposite some time ago). These trends are driving significant expansion in India GIC revenues, which have over the past five years outperformed service provider growth materially. India GIC revenues have shown a 12.4% compound annual growth rate, or CAGR (versus 9.3% CAGR for top-4 Indian IT firms) over FY12-17," Nomura Holdings Inc. analysts Ashwin Mehta and Rishit Parikh wrote in a report dated 11 September, titled India IT Services: Insourcing a threat to Service Providers. In the five years before that, Indian companies were growing at a much faster pace, compared with GICs. For multiple reasons, boffins in India’s IT industry scoff at any imminent danger posed by the rise of GICs. One reason they proffer is that captives have been present for close to two decades in India, and all these firms with their own GICs continue to outsource work to Indian IT outsourcing firms. Secondly, most GICs, after operating for a number of years, are sold to outsourcing companies as most find it challenging to scale up operations after a certain point. Finally, the number of firms with their own GICs are still few, and most would still like to outsource their technology work than manage the headache of running the operation themselves. Even so, more companies setting up technology facilities or captives should ring alarm bells at homegrown IT firms, analysts say. There were 1,050 captives with 1 million employees at the end of March 2017, more than double the 558 captives employing about 400,000 people at the end of March 2008 (see table 1). In 2016 alone, 137 captives were set up, as against just 75 captives in 2012 (see table 3). Although industry body National Association of Software and Services Companies (Nasscom) does not specify the business generated from GICs, analysts at Nomura estimate the GICs account for $25 billion of India’s $154 billion outsourcing industry. Again, as details of many of these GICs operating in the country are not made public, details of the largest captives are not available. But, according to analysts at Nomura, of the total of 1,050 captives, at least 150 employed more than 1,000 people at the end of March 2016, compared with 106 captives employing more than 1,000 people in 2012; 550 employed fewer than 200 people in 2016. In 2012, 402 GICs employed fewer than 200 employees (see table 4). “For now, less than 23% of FTSE 2000 companies have their captives in India, and about 50% of Fortune 500 companies from the US have captives in India. Based on our conversations with companies, our belief is that in 3-5 years, 80% of Fortune 500 companies will have their own captives," said Lalit Ahuja, chief executive officer of ANSR Consulting, a Bengaluru-based firm that is India’s largest consulting firm helping global firms set up GICs. More companies now are able to hire and retain people for their captives, even if it means they have to pay a higher salary than IT outsourcing companies. “I would say Bay Area is an over-fished pond in the sense that like there are a lot of jobs, very less people. Bengaluru has been one of the few areas where we have gotten a lot of talent, both in senior architecture roles, data science areas and machine learning domains in such a way that we are able to leverage it for all the problems we are trying to solve," said Venkatesan of Wal-Mart Labs. The first danger posed by the growth in GICs is in less business for Indian IT firms. Companies such as GE have already cut outsourced technology work from 75% in 2013 to 50% by March 2017. Others like banking giant UBS and DBS Bank Ltd, and energy giant Royal Dutch Shell Plc. have already warned of cutting their dependence on outsourcing and doing work from their captive facilities. Secondly, for now, there is still cost arbitrage between firms setting up their own captives and farming out work to IT firms. “Setting up a captive for a company means they can still do work at a 20-25% cheaper price than outsourcing work to a third-party player," said Ahuja of ANSR Consulting. This is primarily because captives have all employees working on projects; they do not have anyone on the bench, waiting for work to be assigned to them. This is unlike large homegrown technology firms, which still have at least 16-20% of their workforce not working on projects. Again, captives save on marketing costs, unlike IT firms that have to spend considerable amounts on marketing-related costs, Finally, retaining talent for captives is less of a headache than for IT outsourcing firms as the attrition rates for captives is half of that at large IT firms. 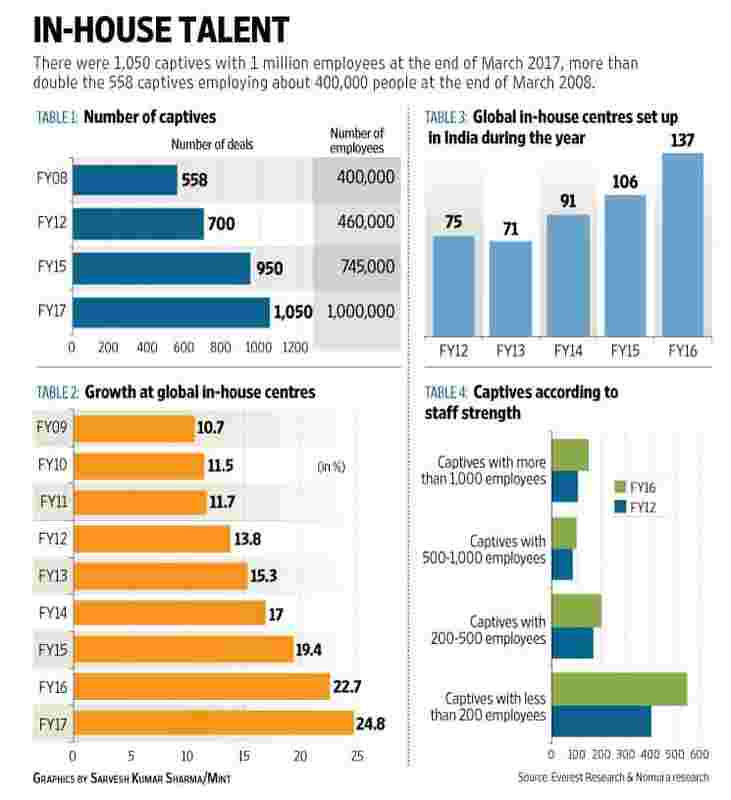 “We are managing 31 captives in India, with a total workforce of 50,000 people, and we have an average attrition of less than 8%," said Ahuja. Attrition at India’s five largest outsourcing companies is between 14% and 21%. Third, GICs for now seem to have reached a stage of maturity as fewer companies have sold their captives in the past few years, prompting experts like Ahuja to claim that “this whole notion of captives being cyclical is not true". Nomura analysts estimate that only eight GICs have been sold to third-party IT firms since 2012, as against 23 in the period between 2007 and 2011. Despite some of these companies continuing to rely on engineers offered by technology vendors such as TCS and Infosys to build applications and provide support for maintenance work, Fortune 1000 entities are looking at their own facilities to do work by using technologies such as data analytics or automation or machine learning platforms. This means a large portion of the digital business is being done by these firms themselves rather than being outsourced. As these clients are spending less in legacy areas such as application maintenance and spending more on newer digital solutions, Indian IT firms are getting hit from both sides. Traditional work is coming at lower billing rates (and less revenue), while they are competing against a client’s own technology facility when bidding for work which is growing at a faster pace. “We see many clients (across industries) revisiting their sourcing arrangements. This is driven by the fundamental operating model shift from technologies such as artificial intelligence or machine learning or robotics to work in more ‘agile’ processes, which, in the optimal scenario, requires (IT vendors to have) co-located, cross-functional teams," said Ralf Dreischmeier, London-based head of technology practice at The Boston Consulting Group. To be sure, more companies looking to expand their own captives should not mean the death of outsourcing. Both Venkatesan of Wal-Mart Labs and Sumit Mitra, CEO of Tesco Plc.’s Indian unit, maintain that these companies will continue to engage with third-party IT firms. “We have traditionally not been too big on outsourcing, but one of the things we are closely looking at is to do the essential tech work from our office here (in Bengaluru) while we can look at outsourcing more work, which are mundane and repeatable tasks, and which can be done cheaper and better by IT outsourcing firms," said Mitra of Tesco Bengaluru. For now, IT outsourcing firms maintain that insourcing of tech work does not pose a danger to these companies. “Infosys noted that it has only seen a few extreme cases of insourcing of work by large enterprises to their captive units and that, too, is mostly in the engineering services area. In most other cases, it sees captives as being additive to vendors, and not a threat to revenue," BNP Paribas analyst Abhiram Eleswarapu wrote in a note dated 15 December. In 2015, Infosys spent $1.4 million to pick up a minority stake in ANSR Consulting, suggesting that the firm does concede that this growth cycle in captives is for real and what ANSR boss Lalit Ahuja calls an “irreversible change". Ahuja declined to comment on ANSR’s partnership with Infosys, citing client confidentiality. In the case of TCS, Eleswarapu wrote in a note that management believes “captives typically gain from internal cost reallocation and tend to be more focused on compliance-related areas". Wipro Ltd still maintains that the growth of captives is more a cyclical phenomenon and does not pose any structural challenge. CEO Abidali Neemuchwala said in an earlier interview that captives normally tend to outsource work once they believe they can no longer match the efficiency and quality offered by IT outsourcing firms. Still, many analysts say the rise of GICs is a challenge Indian IT firms can’t ignore. “We think recent trends in insourcing take-up should worry SPs (service providers) as it is large and growing faster…recent trends suggest widespread adoption across verticals, EU/Japan (similar incremental setups in EU versus US) and smaller clients (equal split versus large clients). Profile of work is becoming more strategic and not just cost arbitrage: GIC’s capture ~25% of digital services scope, expected to grow at 4-5X SP growth rate over the next 3-4 years," Nomura analysts wrote in their 11 September report.